The solo pilot will avoid fiber, to forestall the need to go to the bathroom. Abu Dhabi—The keys are self-hypnotism and lightweight design. Bertrand Piccard, president and pilot at Solar Impulse, will try to fly nonstop around the world on an airplane powered by solar energy and batteries in 2012 or 2013 to demonstrate to the world that there, potentially, could be a new way to fly, he told an audience at the World Future Energy Summit taking place in Abu Dhabi this week. Piccard and his partner, Andre Borschberg, have run a number of computerized simulations on how a plane of this sort should behave in various circumstances and have built a slightly scaled-down version of the plane. It works. Later this year, they will try to take the plane up to 27,000 feet and fly it at night. After that, the two will build a second version of the plane and attempt a transatlantic crossing . If all goes well, a solo pilot will then take the larger version of the plane on the world voyage. The project has been underway so far for seven years. The final version of the plane will be the size of a assenger jet but have the build of a bike. It will have a 64 meter wingspan, a breadth which rivals the jets produced by Airbus, but it will only weigh 1.6 tons, or about the same as a compact car. Put another way, the plane will carry about eight kilograms per square meter, compared to thousands of kilos per square meter of a conventional jet, he said. 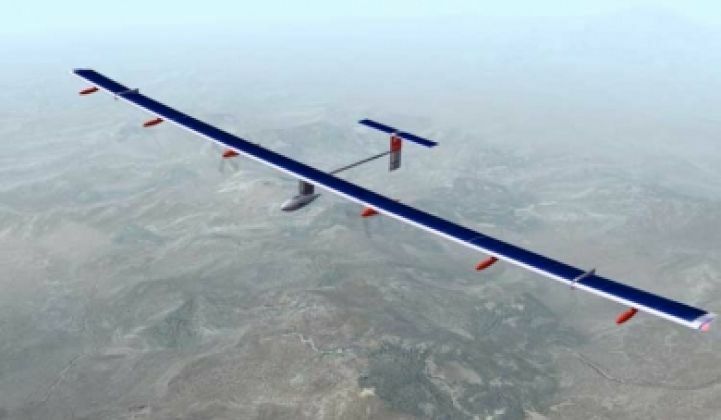 “For every twenty kilos, you need one more meter of wingspan,” Piccard said. The plane will be powered by four motors, which will turn propellers, and solar panels mounted on top of the wings. The solar panels have to be large enough to propel the plane during the daytime and charge the lithium ion batteries during the day so the plane can fly at night. The designers could put a gas generator on the plane to charge the batteries at night, a la Chevy Volt, but Piccard says that the extra weight of the gas generator would be better used by putting more batteries on the plane. The full-fledged plane will hold a 160 kilogram payload, enough for a passenger, a parachute, a life raft, water, food, and oxygen. So what will pilots of the plane eat? On the short flights and across the Atlantic, the solo pilot will avoid fiber, to forestall the need to go to the bathroom. On the circumnavigation, high-energy food, “like dry pasta” will be on the menu. The plane is not an easy one to fly. It has a significant amount of inertia, which means that a shift of the joystick does not cause an immediate reaction on the direction of the plane. It’s more like driving a sailboat: pilots have to shift the controls, wait, and let the plane shift on its own. “Good pilots crash on the simulation,” he said. Why do it? The public thought Lindbergh crazy, but a short time after that passenger planes were all in vogue.